DID YOU KNOW: WHICH ANIMALS LOVE WATERMELON THE MOST? - What About Watermelon? You are here: Home / General / DID YOU KNOW: WHICH ANIMALS LOVE WATERMELON THE MOST? DID YOU KNOW: WHICH ANIMALS LOVE WATERMELON THE MOST? You’d be hard pressed to find an animal that didn’t like watermelon. Its combination of sweetness and juiciness make it an ideal snack for just about any living creature (except goldfish… mine don’t seem to care for it). But there’s one animal that will go to great lengths to get its hands on some watermelon, and that’s the raccoon. Speaking of animals loving watermelons, below is video of elephants being fed whole watermelons at a zoo. Skip ahead to the 1:30 mark to watch Asali the elephant gulp down a rather large watermelon for her birthday. Once she gets it cracked open, she really seems to enjoy it and it’s neat how she uses her trunk to work the watermelon around in her mouth. Who knew raccoons and elephants (especially Asali) would like watermelons. They have good taste in fruit. I didn’t know it either, Ellen. But now I do, and I’ll be especially protective of my watermelon whenever raccoons or elephants are around. 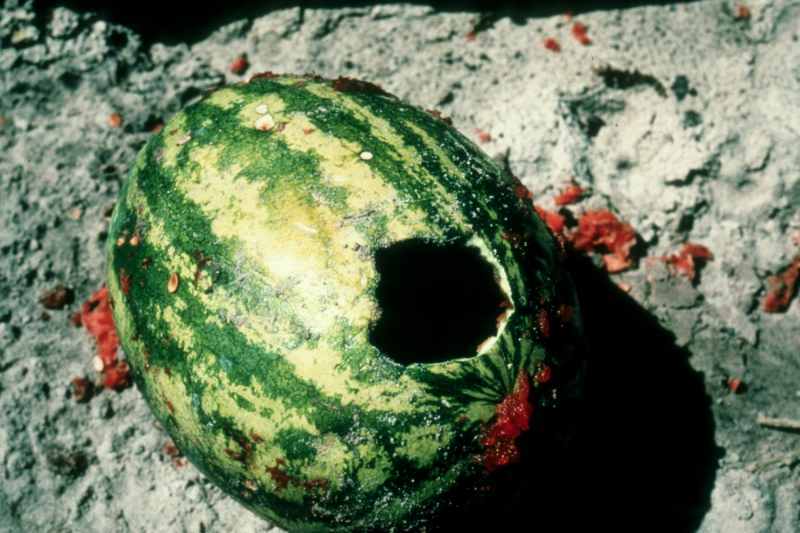 I just found this site because I was wondering if raccoons eat watermelon. I have a raccoon that comes every day and eats dry cat food I leave on the porch for my cats 24/7 . I just finished a half of one and what’s left I put in the shade where Charlie that’s what I call the coin. It may be a Charlene for all I know but it’s a big coin. Can’t hardly wait for it to come to see what I have for him/ her lol so i can take a video.